In September 2009 the first VolkswagenFoundation/DAAD Summerschool was conducted in the Central and Southern Kenya Rift and at the University of Nairobi. Twenty MSc and PhD students from the Universities of Nairobi and Potsdam were instructed by Eric Odada (paleoclimatology, U Nairobi), Geoffrey Muchemi (geothermal energy, KenGen Ltd.), Rainer Zahn (paleoceanography, UA Barcelona), Ralph Tiedemann (evolutionary biology, U Potsdam) and Martin Trauth (paleoclimatology, U Potsdam). 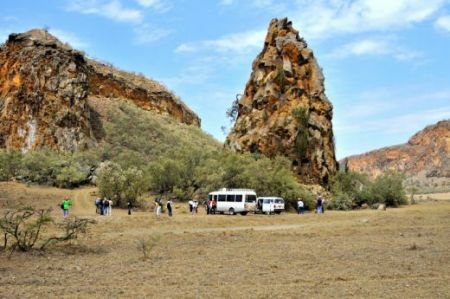 The summerschool comprised a one-week fieldcourse in bio-geosciences to selected key sites in the Kenya rift valley that display interactions between the geosphere and the biosphere. The fieldcourse was complemented by evening seminars that aimed to deepen the insights presented during the day-time classes in the field. They were be held by the instructors and present up-to-date overviews on the themes of "Volcano-tectonic evolution of the East African Rift Valley" (Trauth), "Mammalian and Hominin Evolution" (Tiedemann), "Indian Ocean (Paleo)Oceanography and East African Climates" (Zahn). The second part of the summerschool was a one-week shortcourse on statistical and numerical analysis of environmental data using the software package MATLAB by The MathWorks (Trauth). This course was hosted at the University of Nairobi, Geology Department and taught in a seminar room. In the next years, we wish to establish annual summerschools in the field of geo-biosciences in East Africa including the disciplines of geodynamics, structural geology, paleoclimatology and evolutionary biology. The summerschool will be announced in winter of each year. The students from both countries, Kenya and German, but also from other African countries will send formal applications including cover letter describing the motivations to participate, a full CV including copies of relevant certificates, and contact information of referees.